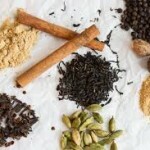 Recently, I’d been having a hard time finding a local, reliable source for organic bulk culinary spices so I decided to try ordering some online from Mountain Rose Herbs. When my package arrived, I was thrilled to open each spice packet, smell all the mouth-watering scents and spend the time refilling my spice jars. To my further delight, I noticed the box also contained a recipe for Coconut Chai Pudding. I’m always in the market for a healthy sweet treat options so I whipped up a batch. Since the change of the season, my cooking had incorporated more and more warming herbs and this recipe looked to be a great way to have a healthy dessert utilizing some of them. I’ve never been one to follow a recipe exactly so what you see here is my interpretation of the original recipe. Enjoy! Shake the can of coconut milk vigorously before opening. This helps to mix the cream and the water together. Open the can and empty the contents into a tall mason jar. Measure out the coconut water and pour into the empty can of coconut milk. Mix with a spoon in an attempt to get as much of the coconut cream from the can as possible. Pour this into the mason jar. Measure the spices, salt and honey and add them to the coconut milk-coconut water mixture. Add the coconut flakes or cacao nibs, along with the chia seeds. Put the cap in the mason jar and shake vigorously. If you have an immersion blender, you can use this to combine the mixture as well. Taste and adjust the seasonings accordingly. Place the jar in the refrigerator for at least 2 hours, though 8 hours is optimal. Scoop into small bowls and enjoy! Note: this dessert is best enjoyed within a few days of making it.